I’ve been wanting a slide duplicator for some time now. I’ve got a lot of slides from college as well as a lot of family slides that I want to digitize. I picked up a Pentax Bellows M with Slide Duplicator off of eBay for a damn good price. Below is a quick test with minor adjustments. I attached an old Pentax K mount Sigma 70-200 on there and adjusted it in to place. And voila. 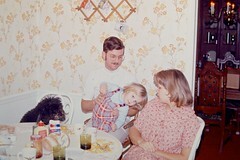 Mom, Dad, my Sister & Iggy the dog. The date says December 1973 but I think that’s probably the processing date and that the photo is from earlier in the year. I’ve never been able to justify a dedicated slide scanner. But for $80 shipped I couldn’t pass this up. So now I need to dig up a bunch of slides and get my parents to mail me what they have all boxed up and get to work.